When I had two peerage scrolls on my calendar I surveyed my C & I supplies for missing necessities. I ordered them on John Neal Bookseller's website. I'm a sucker for books so I also looked for their's on clearance. I found Enrich Your Calligraphy by Diana Hardy Wilson and decided to take a chance on it. I particularly like the information and encouragement on developing visual awareness. While Hardy writes for calligraphers the information on seeing details applies to illumination as well. Enrich Your Calligraphy is an easy to read book for the calligrapher who has more developing and exploring to accomplish, which is most of us. 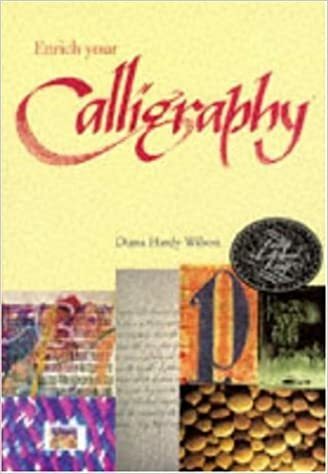 It's a unique book for a devoted calligrapher or lover of lettering.